Clip On Straight 8 Inches ~ In search of adding a little extra length to your existing style? The Clip On Straight (8 Inches) is a great way to accomplish just that. This 8 inch length hairpiece adds just the right amount to your current hairstyle to give it the look you need. What separates this clip on from many others is that the fibers are made from 100% human hair. This helps to create an even greater illusion that you're not wearing anything extra on your head, and that it is simply your natural hair growth. The straight hair comes down any place you need it to. Simply attach the clip on easily anywhere it needs to go, and you're all set. 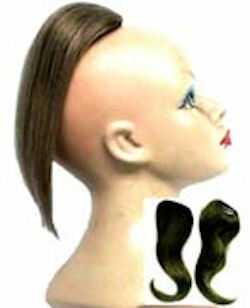 Commonly the hair is placed up into a bun, and the Clip On Straight would be attached at that location. Before placing the clip on in your hair, you can even add your own style to it. Since it is real human hair, the fibers can be manipulated and styled anyway you need them to look with no problems at all. Easily find the color that best matches your own, and add this beautiful hairpiece to your cart today.